Lacklustre Tigers Face Uphill Battle after Derby Day Defeat. Hexagon Telford Tigers 1 took a short road trip to Solihull on Saturday night to take on the Barons in the first leg of the NIHL North Playoff Quarter Final. Tigers had finished third in the NIHL North and were fresh from a 9-3 victory over their local rivals last weekend. Tigers added Dan Mitchell and back up net minder Matt Draper from Shropshire Huskies but were still without the suspended Andy McKinney. Tom Hovell started in goal for Tigers with Josh Nicholls in goal for Solihull. A lacklustre first period for Tigers saw them concede three goals without response. Scott McKenzie was called for hooking in the 8th minute handing Solihull a power play. Adam Brittle scored for Solihull with 10 seconds of the power play left. Luke Brittle then scored Solihull’s second of the game and was closely followed by a goal from Matthew Maurice to leave Tigers reeling. Solihull dominated most of the play in the period but were caught out by a long range shot from Danny Rose, who finally get Tigers on the scoreboard. Tigers ended the period 3-1 down and nowhere near their best. The break seemed to help Tigers as two minutes into the period Adam Taylor scored from a McKenzie pass. Just as it seemed Tigers were back in the game, they conceded three sloppy goals. First Niklas Ottosson scored, followed by goals from Adam Brittle and Luke Brittle to put Solihull 6-2 ahead at the half way mark. Tigers struck back with a neat finish from Ricky Plant to reduce the deficit to 6-3 at the end of the period, but Tigers were still some way off their usual standard of play. Tigers started the third period with two quick goals of their own to fight their way back into the tie. Plant added his second of the game closely followed by a wrist shot from Jack Watkins to draw Telford back to within just one goal of Solihull. As Tigers fought to level the game they were caught on the break by Luke Brittle who completed his hat trick and put Solihull 7-5 ahead. Tigers were unable to add to their tally and end the first leg trailing by two goals ahead of the second leg in Telford on Sunday night. 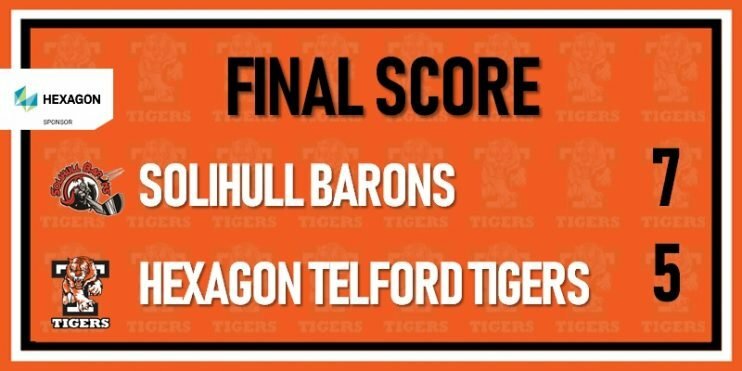 Final Score: Solihull Barons 7 Hexagon Telford Tigers 5. Scorers: Danny Rose, Adam Taylor, Ricky Plant (2) and Jack Watkins. Man of the Match: Dan Mitchell. After the game coach Tom Watkins commented, “That’s what makes playoff hockey so enthralling. If you don’t play hard or compete like your life depends on it, then you’re going to get beat. Solihull played with a real desire and competitive edge tonight. They were short benched and yet they outworked us for sixty minutes. We can’t turn up expecting to win, you have to earn it. They played the right way tonight and we didn’t.